Brands who offer consumer support on Twitter respond to tweets on average eight times faster than the typical brand email response, but only two in five successfully resolved the customer’s enquiry on the social network, reveals a new study. 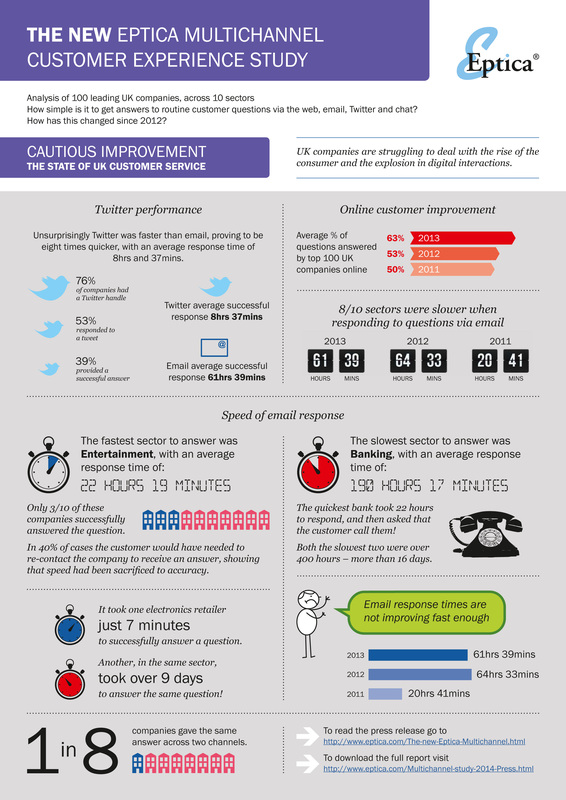 Eptica surveyed 100 leading UK companies across 10 sectors and found that 76 percent had a presence on Twitter, with 53 percent responding to customer tweets, with an average response time of 8 hours and 37 minutes. This compares to an email average response time of 61 hours and 39 minutes. However, only 39 percent of brand responses on Twitter were deemed to have successfully answered the customer’s enquiry. Eptica have summarised their findings in the infographic below.